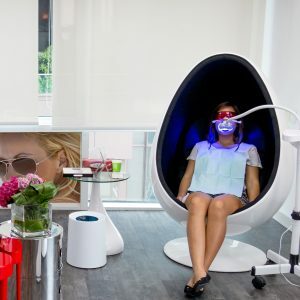 Our teeth whitening specialist centre is dedicated to provide you with the most up-to date cosmetic treatments to recover the whiteness of your teeth. We only use peroxide-free products, which therefore makes our treatments 100% safe for your teeth and gums. As a result our clients experience no tooth sensitivity at all after the treatment. Our aim is to offer the highest standards of quality in the teeth whitening industry. Furthermore, we guarantee effective and safe cosmetic treatments at an affordable price so that our services are accessible to everyone. Our treatments are 100% peroxide-free making sure you will have no side effect like tooth sensitivity or gum sore. In as little as an hour you can expect up to 10 shades whiter without any pain. Our different treatments are tailor-made for your needs starting from 750HKD. Our centre is at the heart of the bustling Central district, allowing you to come whenever you have an hour of free time. Highly recommend! I noticed a difference after one 20 min session and my smile was much whiter after three. No pain and very easy process. Great before an event. I had a great experience at the smile center ! From the moment I stepped inside the clinic I was greeted with a friendly relaxed atmosphere and the clinic itself was beautful, clean and comfortable. All my questions were answered before I even asked and I was instructed very easily about how the procedure would work and any concerns I had were quickly addressed. I am so happy with my result and will definately be back! Thank you Smile Center! Highly recommend for first timers, non-peroxide and doesn’t damage your teeth and the procedure was quick and easy. The therapist was lovely, friendly and helpful throughout, explaining the whole process thoroughly. Noticeable results when finished would recommend to friends and come back again. Amazing experience all together. The centre is very hygienic and relaxing. The therapist talks you through every single step and really makes sure you are comfortable. Met the owner after my treatment and we had a lovely chat. Definitely coming back! Had a Premium treatment whitening service at Smile Center. They are very professional, nice, and efficient. It was such a positive experience. I will be going back for maintenance. Results were incredible without experiencing any pain or sensitivity. Loved the convenience of where they are located. Highly recommend this service.